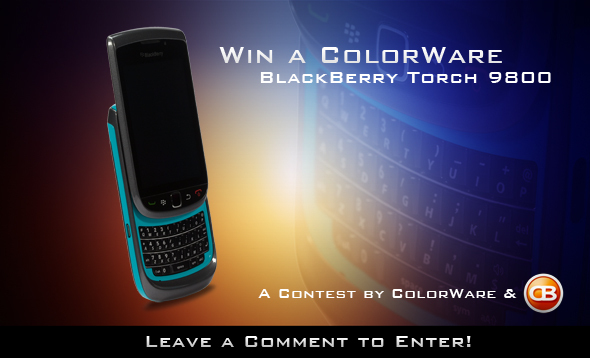 Contest: Win a Custom-Painted BlackBerry Torch Courtesy of ColorWare and CrackBerry.com! You pick the color scheme!! Leave a comment to this post for your chance to win a ColorWare Torch!! Update: Contest has been extended to November 28th! Enter Now if you haven't! Step right up boys and girls... for your chance to win a custom-painted BlackBerry Torch!!! That's right folks, we're giving away another BlackBerry Torch to a lucky CrackBerry reader, and this time it's coming to you courtesy of our friends at ColorWare. The Prize: The lucky winner will win a BlackBerry Torch 9800 and get to paint it in the color scheme of their choosing. You can jump over to ColorWare's BlackBerry Torch 9800 Design Studio to figure out how you'd do it up. Keep in mind it's an unlocked OEM non-CDMA phone, which means you'll need to be running it on GSM network (best on AT&T in the USA (T-Mo works, but no 3G), Rogers in Canada, etc.). How to Enter: To enter, JUST LEAVE A SINGLE COMMENT to this blog post. You can say whatever you like in the comment, though we always love to see comments about how much CrackBerry and ColorWare rock! Or let us know what color you'd paint your Torch if you win. Contest ends Sunday, November 28th at Midnight PST. That's it. GOOD LUCK!! !